LACHANE is back with a fresh new video for 2018 - "Cramp" came out earlier this week on Invisible Oranges! This gorgeous new film is the latest work from video synth artist tronotape and is the second single off LACHANE’s new self titled album out 02/09/18. Click HERE to watch the new video for "Cramp" on Invisible Oranges. Click HERE to pre-order LACHANE’s new self-titled album on cassette, it comes out February 9th via Holodeck. 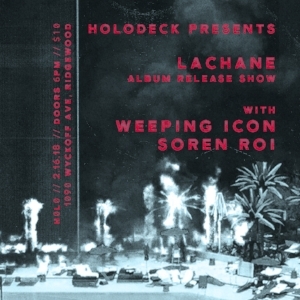 Don’t miss LACHANE live at their album release show February 16th at H0l0 in Brooklyn. Click HERE for more details.